This page is a combination of information from various source around the web including Wikipedia, Ford Courier Collector and Curbside Classic. If you have corrections or additional information you would like to add please leave them in the comments below. For those unaware the Ford Courier nameplate was used on a few different distinct vehicles from 1952 – 2013. For North America these were primarily the 1950s Sedan Delivery variant and the 70s and 80s Mazda B-Series Pickup Trucks. In general most US and Canada enthusiasts more closely associate the Courier name with the pickup however among vintage and classic car collectors the sedan delivery variety is also well known. 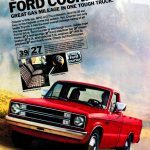 After 1982 Ford would replace the Courier with the Ranger for North America, leaving the 3rd and 4th generation for only international production, namely Australia and New Zealand. The 90s and early 2000s featured a Four Courier Van variant in Europe. Another coupe utility pickup bearing the Courier nameplate was made by Ford in Brazil and imported to Mexico, South America and Africa. This continued from 1998-2013, when Ford unofficially retired the Courier nameplate. Since the purpose of this site is to focus on the North American Courier we will focus in on the two distinct models using the Courier name. The sedan delivery based on early model Ford sedan platform and the Mazda B-Series based pickups. What is a Sedan Delivery? A sedan delivery is a type of car that is a two-door station wagon with a hatchback in the rear. Commonly sedan delivery cars only have front driver and passenger seats or only a seat for the driver. Many sedan delivery vehicles also have no windows in the rear and basic interior including steel sheet metal panels. Sedan Delivery vehicles were heavily used in the early part of the century before WWII by all types of businesses including, plumbers, bakers, delivery services and more. There were even old school ambulances made from sedan delivery vehicles, like the iconic Ghostbusters rig. Today cargo vans are much more commonly used, however you will still these types of vehicles used in specific applications such as a hearse. 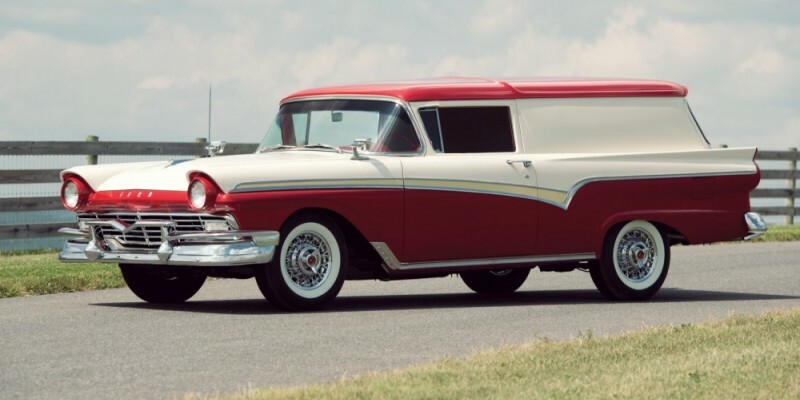 The Ford Courier Sedan Delivery was produced for 8 years in the 1950s with very little change over that time period. Small changes to the rear storage access were the main difference between early models and later versions. 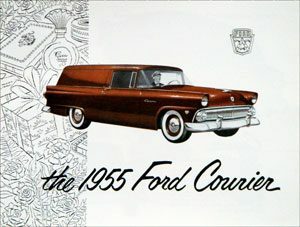 The Ford Courier Sedan Delivery was available with both V6 and V8 engines and most commonly came equipped with the “Ford-o-Matic” automatic transmission. 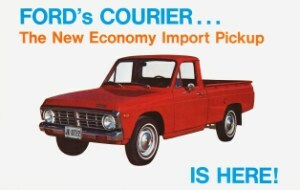 Mazda had been making its B-Series pickups for quite some time when Ford decided to re-badge it as the Courier in the early 1970s. By then Mazda had already been producing the compact pickup since the early 60s and was already in its second body generation. 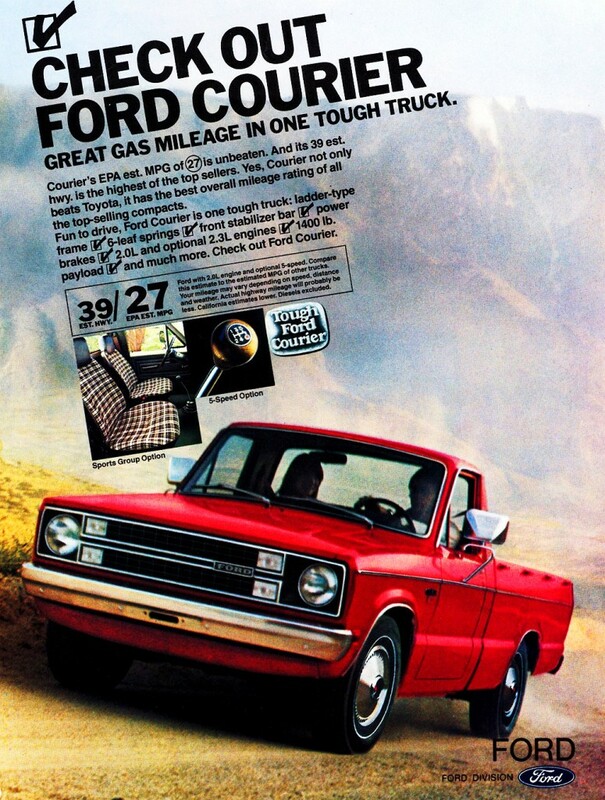 Ford long known for its F-Series trucks, rebadged the Courier in response for the high demand for smaller more fuel efficient compact pickups. This was particularly the case in the United States market due to consumer response to the oil and energy crises of the 1970s. Although Ford would later introduce its own model the Ranger to compete in this segment, the Courier was sold in the US for just over 10 years. The major visual difference between the Courier and Mazda B-Series counterpart was the front grille and large single headlights. These were designed to more closely emulate the F-Series trucks. 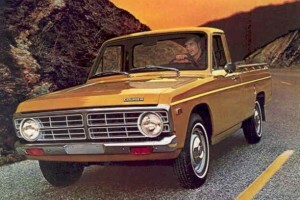 Other than that the Ford Courier was very similar to the Mazda version. Like other international imports of the time, it was also shipped in as a chassis cab to avoid the “Chicken Tax.” For the most part standard beds were attached to the rear however there were also step-side conversions as well as complete flat-bed / box truck installs. The early 70s Courier trucks were largely unchanged during the 5 year production. Like other Japanese compact pickups they shipped with under 2.0L 4 Cylinder engines and a 4-speed manual transmission. Three speed automatic transmissions were available but are rare. These early trucks were 2WD hauling machines (1,400 lb payload) priced aggressively. The main change to the look of early Courier trucks was the badges and emblems. With the size and placement of both the COURIER and FORD logos shifting on the tailgate and hood. In 1976 an upgraded 5-speed manual transmission would be introduced along with a 3in longer bed. Ford upscaled the Courier for the second body generation. This included a style more in line with 1980s automotive design. Listed below are many of the key improvements or added features. Ford would stop selling the Courier in North America by 1982 while they continued to make it for foreign markets. This included varying options including a diesel and turbo diesel engine. North America however was privy to the Electric Ford Courier which was produced from 1979 – 1982. These unique versions were mainly produced for local governments.